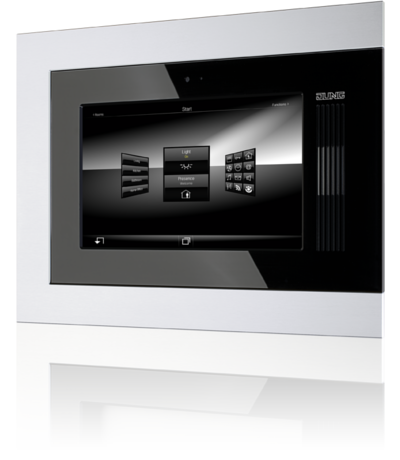 The flush-mounted KNX Smart-Panel 5.1 is the enhanced model of the Facility Colour Touch Panel IP. Thanks to embedded control software, the features are conveniently controlled through the TFT colour touchscreen display. Visualisation and operation is done through the uniform JUNG user interface that allows the various features to be controlled in a logical and intuitive manner. Using the Smart Panel Designer, it is quickly created. As an alternative or additionally, an optionally configurable user interface may be used. It allows the user to implement an individual display representation. Moreover, additional safety is provided by the built-in alarm system that accommodates up to 40 detectors for securing both interior and exterior envelopes. Additional features such as the 64 channel week-timer with building random and astro features, the pre-configured light scenario management, datalogger for consumption data, limit modules as well as logic and time gates help to optimise the features and can be quickly incorporated. Further, both models greatly benefit from easy upgrades that do not require chasing operations to be performed. Since they are installed in JUNG EBG 24 flush-mount housings, existing operating panels are easily replaced by the Smart Panels. Depending on ambience and application, an appropriate design option may be selected from a number of different design frames.